Almost every gardener is familiar with at least one aloe – most often Aloe vera. We usually have a well-ignored pot of it sitting in the garden somewhere, largely unappreciated, grown with the intention of using it for burns and scrapes. Aloe vera is only one member of an amazing family of plants that can add rich texture, color, and interest to any garden, so while Aloe vera may not be rare and collectible, it does have some sexier cousins! Although Aloes are now found in many places around the world, they were originally native to the African continent. There are about 300 documented varieties of Aloes, 170 of which are found in South Africa. The Aloe vera (Aloe barbadensis) in Mexico has naturalized there after escaping cultivation. Trade in many Aloes is restricted by the CITES Treaty. Aloe vera is not restricted, but some of the more threatened varieties are being protected until native colonies have a chance to rehabilitate. Aloes have been cultivated for many years. Aloe ferox and Aloe broomii were depicted on a rock painting that was painted over 250 years ago. Wall paintings from ancient Egypt depict Aloe vera used medicinally and as part of the embalming formula. It was used in Europe in the 10th century and in China in the 11th century. There is a long history of folk medicine and cosmetic use associated with various forms of Aloe. They are reputed to have several medicinal benefits, from a laxative affect, to wound healing, to treating arthritis. As with any natural remedy, extensive personal study should be done before any use, and internal use should be under the supervision of a physician. Aloes are well adapted for harsh climates. Some have spiky leaves and a bitter sap that deters browsing by animals. They are long-lived succulents with waxy leaves that help conserve water making them a great plant for water-wise gardens. There are Aloes that have adapted to mountains, deserts, and even beach habitats. Many Aloes bloom on tall spikes, making them a dramatic addition to the garden. The flowers are often brightly colored and persist for several weeks or months. They take many forms. Some are long and tubular and hang in a modified umbrel like pretty bells on the spokes of a wheel. Some look like bushy “foxtails” atop the spike. Aloes come in many sizes, from diminutive grass-like plants to large tree-like plants and everything in between. There are even “climbing” or “rambling” aloes that will stop traffic when in a mass of bloom. Some aloes are stocky and stemless; some have elongated curving or twisting stems. There are dwarf Aloes that form offsets and thick colonies much like Sempervivums (Hens and Chicks). 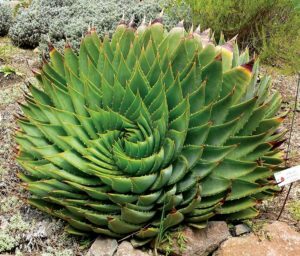 There are green Aloes, gray Aloes, blue Aloes, red Aloes and Aloes with interesting patterns on their leaves. Aloes should not be merely relegated to the dry garden or xeriscape. They can fit in with many garden styles, from containers, to mixed borders, to the tropical look. 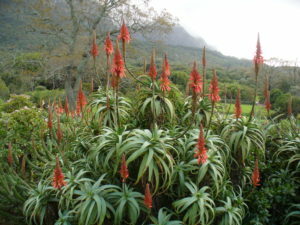 Aloes can be grown in the landscape and in containers. 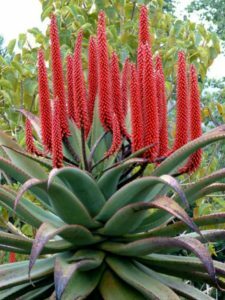 With just a few exceptions, Aloes will not tolerate over-watering, so whatever the method you choose, make sure you provide excellent drainage. Gardeners offer many different recommendations on soil mixes. I like to keep it simple and start with a good soil-free potting mix and then add an equal amount of perlite and mix well before potting. Aloes don’t require much in the way of fertilizer; so if you use a mix that includes a fertilizer, don’t add any at all for the first year, then use 1/3 of any recommended amount about half as often as recommended. This potting mix and fertilizer regime is good for most succulents. Some Aloes prefer full sun but most Aloes appreciate a location with morning sun with a bit of shade from the harshest afternoon sun. Gulf Coast Gardeners are quite familiar with the fact that ‘full sun’ as meant in most catalogs and reference books may not mean full force Gulf Coast summer sun. We move things around until they either adapt or we find just the right exposure for them. This is a good practice for your aloes. Some Aloes will tolerate a shadier location, but they may grow larger than expected. The biggest problem with not providing sufficient light is that the Aloe may not color up as expected. Since many cultivated varieties are specifically chosen for their leaf color and markings, you may lose a lot of the desired attribute if they are grown in too much shade. Here on the Upper Gulf Coast (Zone 9 Harris County, Houston) I have not had to protect my Aloes in recent winters, but most Aloes are not terribly frost tolerant. Provide frost protection for your specimens. Some Aloes can be considered “root hardy”, but the damage to the leaves is unsightly and long-lasting, which virtually ruins the specimen. If you have a winter-damaged Aloe, keep it until it offsets and start over. When we get a really severe winter storm (like one of our weird years with a week of ice storms), move them into the greenhouse temporarily. Since some Aloes bloom when temperatures are cool, move them out as soon as you can and just provide a frost cover on most nights. Aloes, especially the more desirable varieties, are not always available at chain garden centers, but sometimes an exception can be found by occasionally looking through their succulent racks. If nothing else, this is a good and inexpensive way to collect many of the more commonly cultivated varieties. They will be smallish specimens and can be grown in containers for many years. The best chance of finding a great new Aloe is at good independent nurseries, nurseries specializing in succulents, and as pass-a-longs from other gardeners. Propagation of Aloes is easily achieved through division of offsets. Don’t be too quick to divide them however if you are looking for a lush clump brimming with blooms. Aloes can also be propagated by seed. If your different Aloes are blooming at the same time, you have the opportunity for hybridizing. In fact, Aloes will hybridize freely in the garden. Keep this in mind if you are trying to propagate a particular variety. You might have to bag the flowers and hand pollinate to keep the seed true. Sow the seed on the surface of a seed starting mix and cover with a light coat of vermiculite or clean sand. The seed will germinate when sown right on the surface, but it is light and can easily blow away if not covered. Aloes may take 4 – 5 years to mature, but they are attractive specimens even when they are juveniles. This site is a good reference for Aloes. It also has many great photos for ID purposes and specific cultural tips. Desert Tropicals.